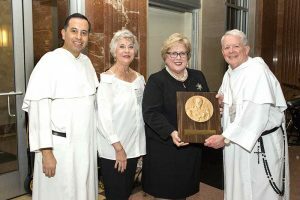 New Orleans, LA – Dr. Cynthia Thomas, an Associate of the Dominican Sisters of Peace and President of St. Mary’s Dominican High School, a sponsored school of the Congregation, was awarded the 2018 St. Martin de Porres Award at the Southern Dominican Province Gala on November 8, 2018. 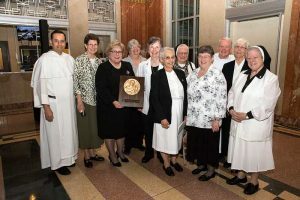 The Martin de Porres award recognizes individuals who are dedicated to the mission of the Dominican Order and who emulate St. Martin’s spirit of compassion, mercy and the search for truth. Thomas was introduced to the Dominican life at a young age. Growing up in Independence, Louisiana, she worshipped at a parish church staffed by the Dominican Friars and was taught by St. Mary Dominican Sisters at Mater Dolorosa Elementary. Thomas received her bachelor’s degree at Nicholls State University, then began discernment with the St. Mary Dominican Sisters. She completed five years of the congregation’s initial formation program. Thomas was named the first lay Principal of St. Mary’s Dominican High in 1992, and continued to serve the Order and the people of the Church by working with the Sisters as the high school’s first lay President in 1997. In partnership with the Dominican Sisters of Peace and Dominican’s Board of Directors, school leadership and administration, Thomas is responsible for developing and implementing strategic plans, goals and objectives for St. Mary’s Dominican High School, viewed through the Dominican lens. Thomas holds a doctorate in education from Spalding University as well as two master’s degrees: a master of education from the University of Holy Cross; and a master of religious education from Loyola University. Thomas is currently a Dominican Associate (OPA) with the Dominican Sisters of Peace. She also serves on the Executive Board of the Dominican Association of Secondary Schools, the Board of Directors for Boys Hope/Girls Hope of Greater New Orleans, and on the Advisory Council of Archbishop Shaw High School.